Valves are narrowly lanceolate with gradually attenuated, very narrow subcapitate apices. The raphe is filiform. Proximal raphe ends are bent to the secondary side. Distal raphe fissures are also bent to the secondary side. The axial area is narrow and merges into a lanceolate to rhombic central area formed by irregularly shortened and more widely spaced striae. Striae are radiate at the valve center, become parallel near the valve ends and then convergent at the apices. Areolae are coarse, number 24–28 in 10 μm and are easily distinguished in LM. Navicula winona has been collected from three lakes in Flathead County, Montana. 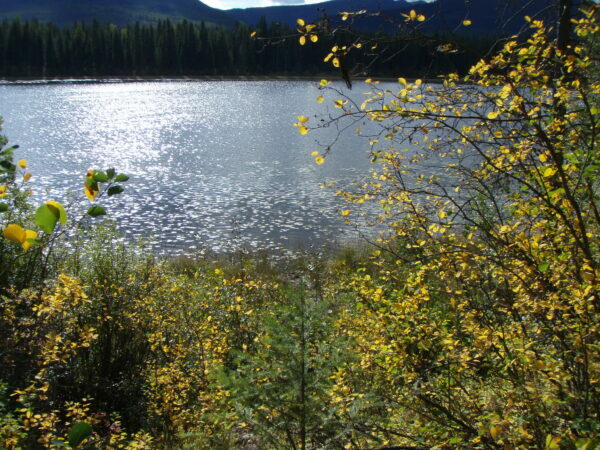 These lakes are alkaline (pH range = 7.2-7.8) with moderate levels of electrolytes (specific conductance range = 140-332 μS/cm). This taxon is named for Lake Winona in the remote North Fork Flathead River Valley on the western edge of Glacier National Park. Credit: Billy Schweiger, National Park Service. 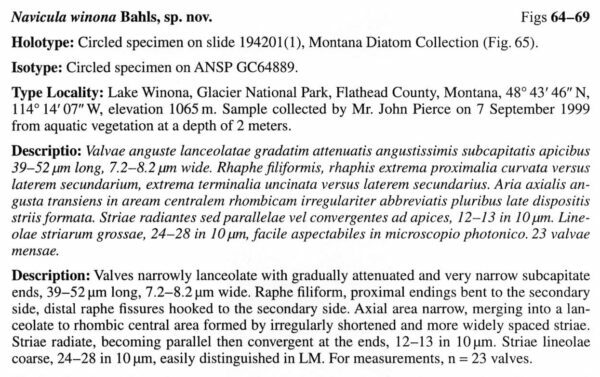 Lake Winona, Glacier National Park, Montana: type locality for Navicula winona. Valves narrowly lanceolate with gradually attenuated and very narrow subcapitate ends, 39–52 μm long, 7.2–8.2 μm wide. Raphe filiform, proximal endings bent to the secondary side, distal raphe fissures hooked to the secondary side. Axial area narrow, merging into a lanceolate to rhombic central area formed by irregularly shortened and more widely spaced striae. 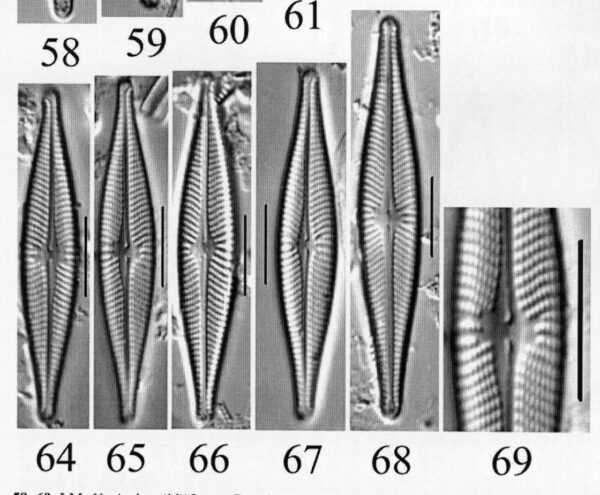 Striae radiate, becoming parallel then convergent at the ends, 12–13 in 10 μm. 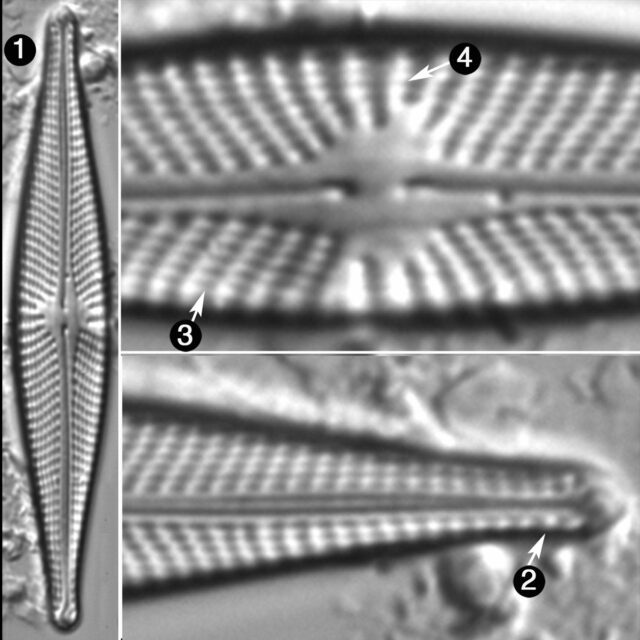 Striae lineolae coarse, 24–28 in 10 μm, easily distinguished in LM. For measurements, n = 23 valves. Navicula winona has narrowly lanceolate valves with gradually attenuated, narrow subcapitate apices. Areolae are coarse and number 24-28 in 10 μm.